My dilemma is that I have no great MEAL to show you today... and maybe not even TOMORROW! (hopefully tomorrow) So I thought, "right, what can I show them?" I talked to my sister this morning about what I might blog about... I thought about making the entire post about her failed TollHouse chocolate chip cookies story, but I didn't want to embarrass her. ;) (ps- she did actually make them again yesterday and they turned out beautifully) Then she suggested that I just give you some side dish options... then I remembered! Just before we left for Australia and we were trying to get through all of our groceries, (remember that?) 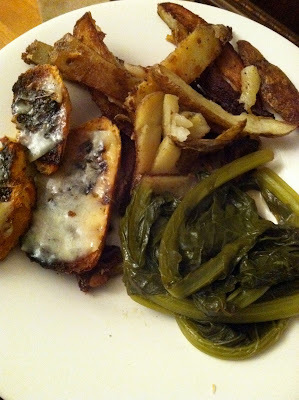 I made a really great, weird, vegetarian dinner for myself of turnip greens, skillet potatoes, sauteed onions zatar pita and hummus! I know, I know, hodge podge but it was all that was left in the fridge, so I went with it! Anyone interested? 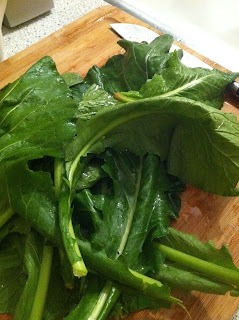 Grab a bunch of turnip greens and wash them really well. I mean well. They git gritty and it's so gross to chomp down on who knows what that feels like beach sand when you're just trying to enjoy dinner. I like to leave mine in whole leaves because I think it looks prettier, but it can get annoying trying to cut them after they've been cooked, so if you want, chop them in 3 sections per leaf. Warm up a little saute or saucepan with some olive oil (surprise) and balsamic vinegar. Do it on medium-low heat. When it starts to get a little sizzling, put the greens in. 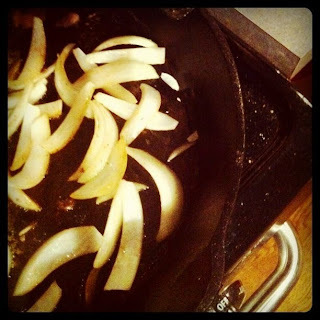 It's okay to stuff them... remember, turnips cook WAY down. Put the lid on and let them soak in all that oily vinegar goodness for about 3 minutes. Remove the lid and add some water. Don't drown them, but don't be shy either. Now stir. Put the lid back on and turn the heat down just a little. Now let them steam in there for about 5 minutes. But don't do them too much longer than that! You want them to still hold some of their brighter green color and some crispness... otherwise you've nuked out all the nutrients and there's no point. If you're not used to eating crunchier greens, get over it... your body will love you for it. yes, that is vegemite toast with melted cheese... james made it and i couldn't resist. "cheesy-mite," as we affectionately call it. 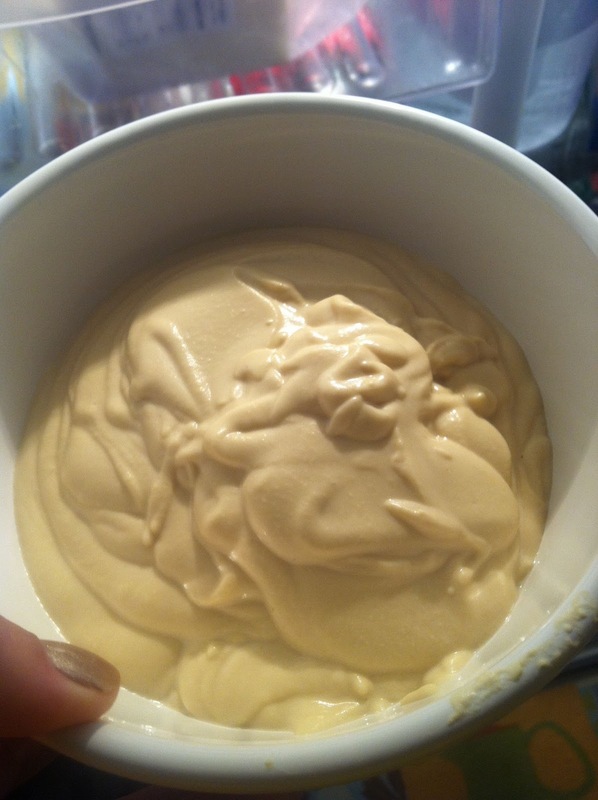 Remember how to make homemade hummus ? 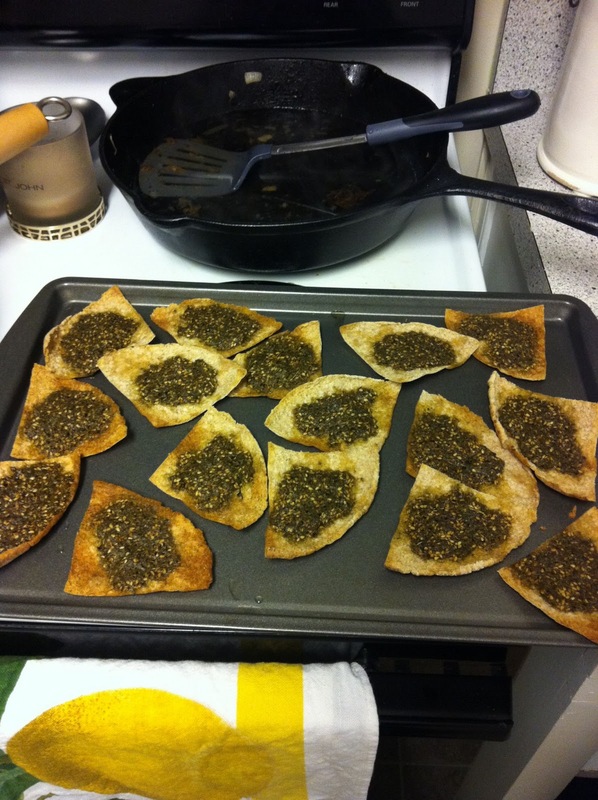 This is zatar on pita. (ZAT-uh) It's a middle eastern mixture of spices, sesame and salt. You can buy it at an arabic grocery... harder to find other places. You make a paste out of the mixture and olive oil, spread it (sort of sparingly if it's your first time trying it) on some pita wedges, and stick it in the oven for 10 minutes. Killer. Especially with hummus. Skillet Potatoes: aka- homemade steak fries...? Generously sprinkle in some seasoned salt. 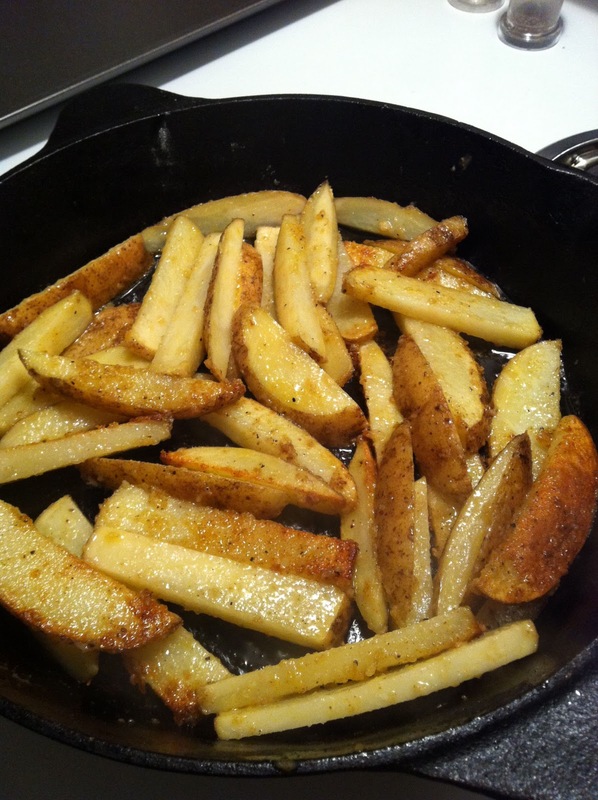 While that's warming up, slice up your potatoes into longer bits and maybe half to an inch thick. If you have time, let them sit in boiling water for about 5 minutes before putting them in the skillet, but if you don't have time, that's alright. 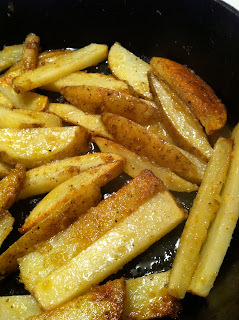 Throw them in the skillet, toss a little more seasoned salt and olive oil on top, and put the lid on. Let them sit with the lid on for about 10 minutes. Now remove the lid, turn the heat up to medium heat, add some sea salt and ground pepper and start stirring them. Now you should start to see them turning golden brown on the bottom. Because these aren't shaped circularly, you're gonna have to make sure to check out each one and make sure they're browning nicely on all sides. 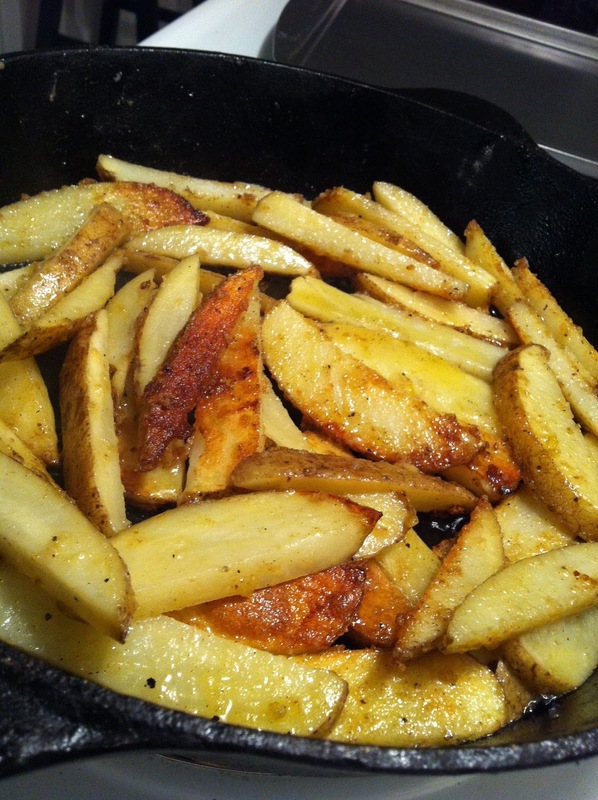 So at this point, keep them cooking until each one looks pleasantly golden and crispy on a few edges. So excuse the random, "side dish" quality of this post, but I hope it was helpful and fun and tomorrow, we should be back on track and completely PASTALESS! In the meantime, wish me luck trying to devour baked ziti for ONE more night. 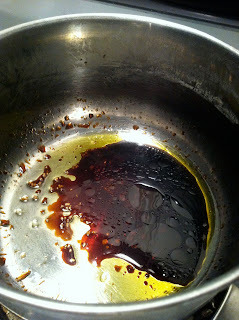 I've resorted to adding my own italian spices, fresh parmesan reggiano and olive oil to freshen things up a bit. Everybody needs a little spice in their leftover pasta life, right?